Despite the enormous praise for this movie, I don't have plan to watch it in cinema. I loathe it when I'm crying in a cinema, that's why I avoid sad movie almost at all cost. Moreover today is the President Election Day in Indonesia and I'm really worry that there will be riot in Jakarta due to the differences in quick count results. But my friend want to see this movie and I have a spare time, so here I am writing my impression of The Fault in Our Stars in my room. I never read the book, that's why this review is from my point of view as a general moviegoer. As the critics and several reviews on the internet said, this is a good movie. It has witty dialogue, impressive liners, great metaphor and adorable characters. I love the couple in this movie. Some people like to compare it with Twilight due to their popularity with teenage girls. 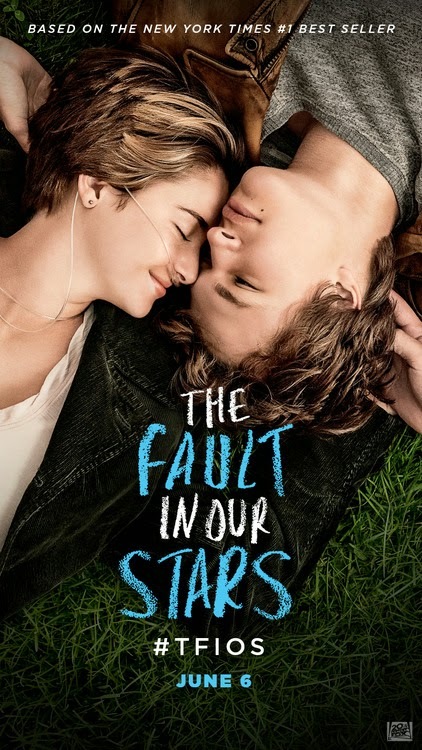 Well, I think Gus and Hazel in this movie is gazillion times much better than that vampire franchise. It's on a really different league that made me almost think it's a blasphemy to even compare those movies. On another note, watch this movie also made me think a lot about myself. When I was in university, I didn't want to be involve in cancer research because I think it's too mainstream. One of my lecturer ask me why instead to find a cure for cancer, I tend to have taken interest in pharmacoeconomy or pharmacotherapy research instead. It turns out I love more about policy making than developing a new drug. Something that I slightly regret later. After I enter the internship to get Pharmacist degree, I saw many cancer patients in hospital. With response rates to drug that generally low, a drug or radiation therapy that can cure one cancer but induce other cancer in different parts of their body, not mentioning the terrible side effects of the medication, it's no wonder that a lot of people taken part in its research. Even after those research, the mortality rate of cancer is still high. Seeing Augustus Waters fighting with his cancer remind me at the time when doctor said to my friend that cancer cells has spread to his body. His parents look at me, slightly wish I would said something soothing, that there's still chance that he will get better. I was tongue-tied, not able to said anything. How can I said to them that when cancer had reach a metastasis, it's almost like a death sentence? That's all we can do is to ease their pain before their time is up in this world. I hate goodbye. Tears start flowing from my eyes as I write this. The Fault in Our Stars is not a sad movie, it fills with bliss and joy. It tells us a story about how to prepare for the worst without being too sentimental. Yes. Pain demand to be felt. Like Gus said, we don’t get to choose if you get hurt in this world, but you do have some say in who hurts you. I hope someday I could say that I like my choices.